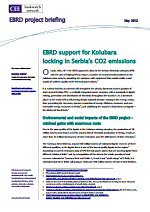 On July 26th, 2011 the EBRD approved a loan to the Serbian Electricity company (EPS) with the aim of helping EPS to reduce a number of environmental problems in the Kolubara mine area, by providing the company with equipment that would enable a coal supply of uniform quality to the thermal power plants. It is evident that this investment will strengthen the already dominant market position of state-owned Serbian EPS - a vertically integrated power company with a monopoly in lignite mining, generation and distribution of electricity throughout the country. As a dominant player in the sector EPS is influencing deeply national decision making in the energy sector, thus preventing the necessary massive expansion of energy efficiency measures and new renewable energy resources in Serbia, and solidifying the country's dependence on lignite - the dirtiest of fossil fuels.